This amateur production of ?One Man, Two Guvnors? is presented by special arrangement with SAMUEL FRENCH, LTD.
‘One of the greatest ever comedy hits, this award winning play originally produced for The National Theatre by Richard Bean has been seen worldwide. ?A magnificent farce of disguise and intrigue. Set in the racy resort of Brighton in the swinging 1960s, the hapless Francis Henshall becomes employed by two men, Roscoe Crabbe, a gangster and Stanley Stubbers, and upper class rogue. Francis needs to keep these two men from meeting to conceal the fact that he is working for someone else. But Roscoe is not all that he seems to be- he is actually Rachel Crabbe in disguise , her twin brother Roscoe having been killed by her lover. Freely adapted from the original classic, The Servant of Two Masters, the audience play their part in the hilariously chaotic chain of events coming to a rousing conclusion. Originally starring James Corden, the Garrick is especially thrilled to present this great comedy. In blissful ignorance I take my usual front row seat to review the Garrick?s production of One Man Two Guvnors. ?It?s a big mistake for I spend the first Act quivering in my boots lest I be picked by the actors for some fiendish interaction. ?At the interval, sighing with relief, I grab an ice-cream to cool me down. ?It is the woman next to me – a Christine Paterson from Timperley – who gets it – and I laugh at her misfortune along with everyone else. I?m hoping she is a stooge and am pretty sure she was because she mysteriously disappeared during the interval. ?Not so, the two blokes who precede her. They looked decidedly troubled when they are dragged on stage to move some suitcases. 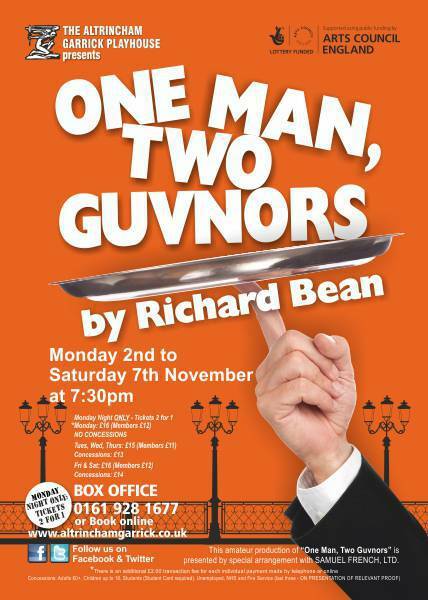 ?Set in 1963, One Man Two Guvnors is an adaptation by Richard Bean of a much older comedy, by Carlo Goldoni but when it is set is irrelevant for the dilemmas enacted are timeless. ?It is lead actor, Barry Spencer playing Francis Henshall who brings down the house but he doesn?t overshadow other clowns in smaller parts. ?Francis is the chump who spends most of the evening running round in circles to please his two bosses putting fathomless energy into his performance. ?The bosses are ex public school boy, Stanley Stubbers (Daniel Ferguson) an upper class buffoon with a far back voice who happens to be a murderer and Rachel Crabbe (Steph Niland) who spends her time pretending to be her deceased brother, one of Stubbers? victims. ?In one of the funniest scenes, Ferguson?s Francis attempts to serve food and wine simultaneously to his masters who are in different rooms. Despite the hard work that has obviously gone into this show, on Tuesday night, the audience are unresponsive which I feel is probably due to the script rather than any poor acting. People I spoke to were hesitant in their remarks about the production. ?Nevertheless, there are lots of amusing moments in One Man, Two Guvnors which are the perfect antedote to poor November weather. ?The on stage skiffle group made up of Michael Clark, percussion, Dave O?Keefe, Guitar and Vocals and Rick Sarko, Double Bass, goes down well.